We need water. Water is one of the few things in life that we absolutely need; without it, we cannot long survive. Jesus offers us pure, holy water that will satisfy our thirst as no other water can. It is drawn from the Well of Life. Once we drink of this water, we won't want any other. All of this makes me think of the Monk episode, Mr. Monk Goes To Mexico. 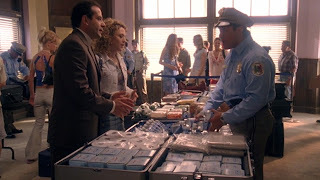 Knowing that he is going to a place that may not be able to fulfill his need for Sierra Springs, Monk brings with him an overabundance of bottled water – just in case. Shortly after their arrival in Mexico, Monk and Sharona are robbed of all their luggage. Food, clothing, toiletries… it’s all gone. But what is the one thing that Monk is concerned about? Throughout the episode, we watch as Monk searches desperately for water. People offer him other kinds, such as Aquafina and Arrowhead, but Monk refuses them all. Sierra Springs is the only bottling company that he trusts. At one point he finds someone with Sierra Springs, but they don’t see its value; they taunt him and pour it out on the ground. During his three day stay in Mexico, Monk drinks no water. Everyone tries to persuade him that the other brands are just as good, but he knows the truth. No other water can satisfy him. Can you see the parallel? There are many false religions – Jehovah’s Witnesses, Mormonism, Pantheism, and Buddhism, just to name a few. They knock on your door, they quote their books to you, and they try to win you over to their side. But we cannot be fooled. We have tasted of the only pure and satisfying water, and we know that no other can quench our thirst. When the world looks at us, they’re confused. They don’t understand why the Bible means so much to us, or why we are so “intolerant” of other religions. They mock us and threaten to torture us, but still we must hold fast. Even if they take away all that we own, they cannot take away the hope that we have in Christ. Monk would rather die from lack of Sierra Springs than seek satisfaction from any other brand. Would you rather die for your faith than turn aside to false religions? Read your Bible. Immerse yourself in it. Consume pure water. Grow in your love for Christ. And stay strong in your faith.